Hellish Simplicity is a clean simple design. Responsive design makes the theme look good on all devices and the header text can be easily modified via the theme customiser or the themes header admin page. Download version 1.5 via WordPress.org! A minor update is also available. I’d been looking for some sort of design to use on my personal blog for quite a while. I had originally been using a theme from Sadish Balasubramanian, one of the most talented theme developers of the earlier days of WordPress. Since my personal blog was very simple, my requirements were not high. 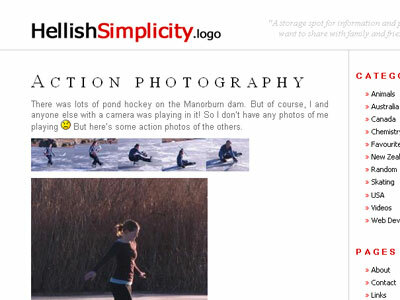 I mostly just needed something clean and simple to display my photos and the occasional bit of text. I tried complex themes, magazine themes, themes with all sorts of fancy features like dropdown menus, funky header images and many others. But one day I saw a rather drab looking van drive down the road. It had clearly been some sort of commercial vehicle in a previous life, but much of the original companies text had been stripped off. This left some very basic grey lines, a red and black sans-serif logo and some badly worn and poorly lined up serif headings. Somehow that gave me the inspiration for what eventually became Hellish Simplicity. Over the time I’ve rewritten it via various tools, including custom theme generators I have written. 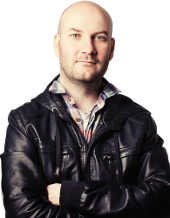 The latest iteration is a regular WordPress theme similar in nature to those hosted on WordPress.org. I do not promise forwards compatibility for child themes and I do not provide extra hooks for adding functionality. However, many people do seem to create child themes of Hellish Simplicity, so to help those people I have created a demo child theme as a base. The child theme is called “Incoming”. You may download it here. Hellish Simplicity was originally released with a restricted license which was later changed to BSD and then GPL. The current version is licensed under the GPL. 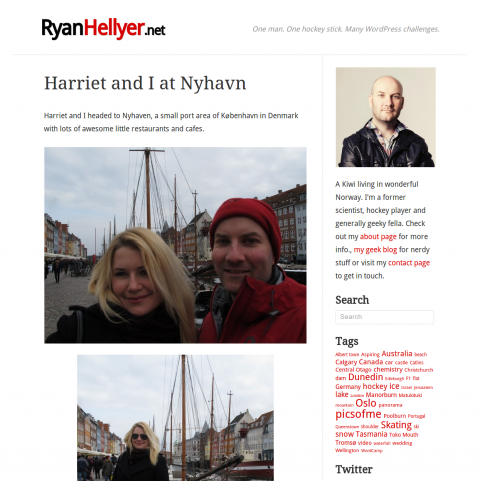 I use my personal blog, ryan.hellyer.kiwi, as a demo for the theme.